THERE will have been a bitter taste in the mouth of Sheffield Steelers’ players on the long drive home from Surrey on Wednesday night. A 5-4 loss at The Spectrum – producing a 9-8 aggregate defeat at the hands of bogey side Guildford Flames – put paid to the Steelers’ Challenge Cup hopes for yet another season, extending their barren spell in the competition to 15 years from when the Elite League was first launched. 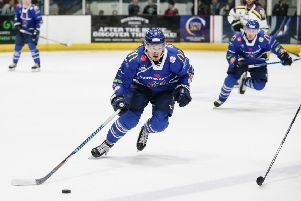 Tonight, however, offers a swift opportunity for the Steelers to end their wait for a win over Paul Dixon’s Flames, who have won four out of the five previous encounters between the two sides this season, with the other meeting ending in a 4-4 draw in the first leg of their Challenge Cup quarter-final. Each season seems to throw up one team who the Steelers have problems defeating, in recent years Cardiff Devils and Coventry Blaze have proved the most troublesome. This time around, it is clearly Guildford. Since joining the club in 2006, Steelers’ captain Jonathan Phillips has been a Challenge Cup runner-up five times but, ahead of a festive schedule that will see his team play six games in 11 days, he insisted the level of frustration from Wednesday was the same for everyone on the team – regardless of how long they had been at the club. “It was immensely frustrating on Wednesday,” said Phillips. “The thing that we keep talking about is playing well defensively and then I think it was twice that we conceded soon after we had scored. “We just can’t accept that as players and we’ve got to be better than that – that is the bottom line. Overall we played well, but these breakdowns we have – especially in a game which means so much, to progress through to the semi-finals – we just can’t be doing stuff like that. Steelers travel to Glasgow tomorrow before the traditional festive double header against Nottingham Panthers on Boxing Day and Thursday. But Phillips insisted the initial focus was on finding a way to beat Guildford. “It’s good for us to play them so soon again. Wednesday is still so fresh and we want to get over that hurdle of not having beaten them this season,” he added. We just can’t accept that as players and we’ve got to be better than that – that is the bottom line.